Register Log In ECN Forum Forums Photos for General Discussion SwitchPanel? Recently, our firm was hired by a property management firm to replace a 120 volt single phase 400 amp distribution panel at a high rise condominium complex. While tracing out all of the loads on this distribution panel, we found a plug fuse panel that serviced the common areas in the highrise. 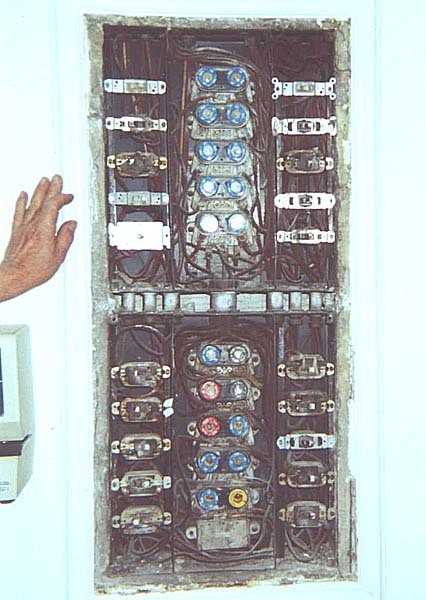 We noticed that the old fuse panel was modified with switches and even a dimmer switch for the common area lighting. This is one of the most interesting modifications I ever saw. Now that's worth a pix! What's more is that somewhere there's probably a maintenance man, time-life book in hand, who's proud of it!!! !